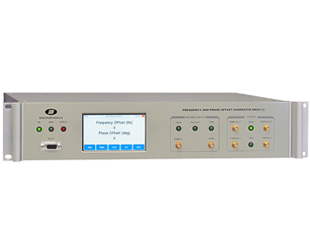 The HROG-10 is a high-resolution phase and frequency offset generator. The phase and frequency of the output signals are adjustable with respect to a 10 MHz user supplied reference. The output phase resolution of the generator is 2pi/232 radians or an output time step resolution of 0.2 fs. The output frequency resolution is 5 x 10-19. Both phase and frequency steps are phase continuous. The instrument provides two sine-wave outputs and two pulse outputs. 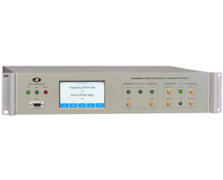 The sine-wave outputs are buffered to provide greater than 80 dB of port-to-port and reverse isolation. The outputs are at a level of +13 dBm. The pulse outputs are derived from the sine-wave outputs by dividing by a factor of 10.0E6. The pulse outputs can be synchronized to an external reference pulse to within 100 ns. All instrument functions are displayed and controlled via the front panel LCD display and keypad. Remote control of the instrument is possible through RS-232 communications.